Many observers of Myanmar’s political transition agree that the success of Burma’s democratic reforms and national reconciliation hinge on the willingness of Aung San Su Kyi’s quasi-civilian government and the Tatmadaw (Burma Army) to accommodate the political demands and desires of various ethnic groups. Chief among those demands is greater political, economic and cultural autonomy in the form of federalism and control over the exploitation of natural resources in their geographic regions. In the area of security, armed ethnic groups have also floated the idea of a federal army formed along ethnic lines to accommodate the security needs of various ethnic groups who remain fearful and distrustful of the Tatmadaw. Military commander-in-chief General Min Aung Hlaing has predictably rejected the idea of a federal army, refusing any compromise. Throughout the negotiation process, the commander-in-chief continues to insist that ethnic armies must be integrated with the Tatmadaw into a single army as a condition for any political settlement with the ethnic armed organizations. In theory, it is understandable why a country should have a single army. No sovereign democratic country under the rule of law has more than one national army. But political observers also agree that forcing ethnic armies to integrate with the Tatmadaw into a single army is not currently practical. With an uncertain peace process and no political guarantees, it will be extremely difficult to convince the ethnic armies to voluntarily subject themselves to the Tatmadaw’s control. On October 15, ten NCA signatories, including the Karen National Union, attended a two-day informal meeting with State Counselor Aung San Su Kyi and military commander-in-chief General Min Aung Hlaing to iron out their differences and find ways to break the impasse in the stalled peace process. In the meeting, General Min Aung Hlaing continued to insist on non-secession and military integration as conditions for further political talks to implement a federal governance framework as ethnic groups demand. To break the impasse and move negotiations forward, the ten NCA signatories, led by the Karen National Union, reluctantly agreed with the Tatmadaw that, in principle, a single army is needed, but that more talks on other pressing issues are needed before they can discuss anything regarding military integration. 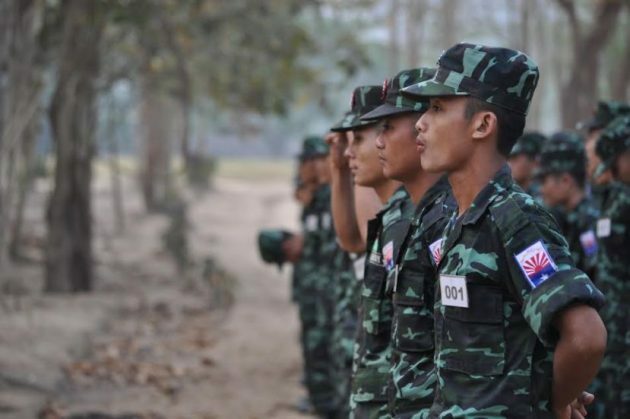 As soon as news broke that the KNU had signed a preliminary agreement to discuss military integration with the Tatmadaw in the future, senior military officers in the Karen National Liberation Army and Karen netizens denounced any notion of cooperation with the Burma Army. Karen communities both inside and outside the country accused the KNU leaders of selling out the Karen revolution for their own interests. In an interview with the Karen Peace Support Network, General Johnny and General Baw Kyaw Heh, the two most senior military officers in the KNLA, strongly opposed any notion of military integration with the Tatmadaw in the immediate future until the demands of the Karen people have been achieved. Similarly, Yawd Serk, Chairman of the Restoration Council of Shan State and leader of the Shan State Army-South, fiercely opposed his army’s integration with Burma’s Tatmadaw unless Shan people approved it or until political issues have been resolved. Why is a single army anathema to armed ethnic groups? There are various reasons why Myanmar’s ethnic armed groups demand the formation of a federal army and refuse to be under the control of the Tatmadaw. These reasons are deeply rooted in political, psychological, and security concerns. During six decades of debilitating civil wars, ethnic groups have formed their own security forces and liberation armies to protect their people and territories from attacks and destruction by government troops. Psychologically and militarily, ethnic rebel armies serve as the pride and protectors of their people. Although Myanmar’s ethnic armies do not always live up to these expectations, they are important institutions and symbols of resistance that many ethnic civilians look to for moral support, guidance and protection from the ethnic Burman-led state. Unlike their political leaders, ethnic armies command near universal respect from their people because of their sacrifice and perceived heroic roles in armed struggle. Tens of thousands of ethnic revolutionary soldiers have lost their lives in the name of freedom for their people, just as the Tatmadaw has claimed to be the protector of the entire country. In Burma’s political history, General Aung San and his colleagues in the so-called ‘Thirty Comrades’ are highly revered and regarded by the majority Burmans as national heroes and liberators from colonial rule. But most ethnic people view them primarily as Burman nationalists who had little genuine interest in the affairs and well-being of the other ethnic nationalities. Ask any Kachin, Karen, Shan, Mon or other ethnic person to name a national hero or days of national importance, and very few would mention such prominent names as Aung San, the ‘Thirty Comrades’ or days important to many Burmans such as Independence Day, Tatmadaw Day or Martyr Day. Instead, each ethnic group celebrates its own revolutionary heroes, political leaders and holidays that are unknown to most Burmans. In other words, Myanmar’s ethnic minority groups see themselves as distinct sovereign entities with their own sovereign armies. The idea of dismantling these armies or subordinating them to the Tatmadaw is unthinkable and politically unacceptable to many. Any central government’s attempts to take away such symbols of pride, power and prestige at the negotiation table or through force will continue to be strongly resisted. Deep-seated fear, loathing, and mistrust of the Tatmadaw means most ethnic armed groups will remain reluctant to lay down their arms or place their armies under government control. For over half a century, government soldiers have perpetrated gross human-rights abuses against ethnic people, including arbitrary killings and wholesale destruction of their communities. The military’s actions have forced tens of thousands to flee their lands and become either internally displaced persons or stateless refugees in neighboring countries. For most ethnic communities, any move to entrust their security completely in the hands of the Tatmadaw is unimaginable. Although the Burmese government has currently declared ceasefires with many ethnic armies, tens of thousands of government troops continue to occupy ethnic territories and commit human-rights abuses against ethnic communities. Discrimination and racism against non-Burman ethnic nationalities has long been state policy and is a major issue discouraging ethnic armed groups from integrating their armies with the Tatmadaw, as the government attempted in 2010 through the creation of so-called Border Guard Forces. Prior to achieving independence, many people of ethnic background held important and powerful positions in both the government and military. After independence, the country’s three most powerful posts in the military were held by ethnic Karen. But ever since General Ne Win took power in 1962, very few people of ethnic background serving in the Tatmadaw have been promoted beyond the rank of colonel. In today’s 500,000-strong Myanmar Army, for instance, no ethnic minorities hold a position equivalent to the rank of a brigadier general. The Defense Service Academy – the country’s most prestigious and powerful military training school – is virtually off-limits to ethnic minority candidates. Most ethnic people who join the Tatmadaw today are largely relegated to the role of foot soldiers and junior officers. Most importantly, despite Burma’s democratic reforms, the Tatmadaw is still perceived by most ethnic groups as an illegitimate and oppressive institution with which they should not affiliate themselves. The Tatmadaw is currently facing unprecedent pressure and charges of crimes against humanity and genocide by the United Nations in the wake of the Rohingya crisis in 2017. As a result, it is becoming an international pariah once again. For many ethnic leaders, joining an oppressive institution that stands accused by the United Nations of war crimes, crimes against humanity, and genocide will only give cover to the Tatmadaw and tarnish the image of the ethnic armies. It is clearly much too soon to discuss any sort of military cooperation between ethnic armed groups and the Tatmadaw. This can only happen AFTER commanders accused of war crimes by the United Nations have been removed from leadership positions, justice has been served for past atrocities, such atrocities have been unequivocally prohibited among the Tatmadaw’s ranks, and the Tatmadaw has been brought under the full control of the civilian government. Once the Tatmadaw has been reformed and brought under civilian government control, it may be appropriate to consider how to integrate the country’s security sector. One possible way ahead would be for the government to allow all ethnic armies to be part of the Tatmadaw but allow military leaders of individual ethnic groups to serve as commanders of their respective brigades or battalions. This arrangement would enable ethnic armies to be part of the national army but also allow them to maintain their distinct identity and feel secure within their own ethnic-based units. This is not an unprecedented formation: during the colonial period and immediately following independence, the national armed forces were still organized largely along ethnic lines. For example, there were the Burma Rifles, Karen Rifles, Chin Rifles, and Kachin Rifles, all of which were part of the Union Armed Forces but led by their respective ethnic commanders. They were effective and instrumental in defending the country against communist insurgents. General Smith Don, an ethnic Karen and the first post-independence army chief, was loyal to the Union government but was forced to resign by Gen. Ne Win as conflicts between Karen revolutionary forces and the central government escalated. More immediately, in order to build trust with the ethnic armies, the government must demilitarize ethnic regions and drastically reduce the number of troops now stationed in border areas. Most ethnic communities still view government foot soldiers in their regions as foreign invaders intent on taking their lands and exploiting their resources. As long as large numbers of government troops are based in ethnic areas, fear and insecurity will continue to undermine trust and prospects for national reconciliation. In order to build confidence in the peace process and develop trust between the Tatmadaw and ethnic armed groups, the government could begin to address political issues, inequality, and policies that discriminate against ethnic minorities. And while ethnic groups negotiate political issues with the government, the Tatmadaw could halt its attacks on all ethnic armed groups and unilaterally announce a nationwide ceasefire. A complete halt in armed hostilities would be an important step towards building trust and forging national unity.